Califone innovative engineering allows schools to deploy this proven technology very cost effectively. 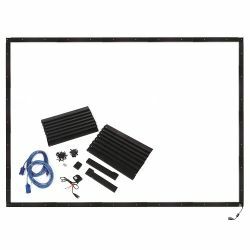 By using a 48' x 64" section of the wall itself, unique line-of-sight sensors in the easy-to-assemble frame create the rim of the board that connects to the computer in the exact same way as a more expensive board. Simple Windows-based software quickly calibrates the sensors and the whiteboard is ready to go!